After years of being neglected, TNT finally gave their Neohome feature a much needed renovation and released Neohomes v.2! However, a lot of users have invested countless hours and unknown quantities of Neopoints in searching for and obtaining the perfect items to deck out their original Neohome so that it looks just perfect. Fortunately TNT have acknowledged this and enabled users to maintain their old Neohome as well as having the option to create a newfangled one. You can also still create one of the old version ones, though they are now referred to as Classic Neohomes. This article is intended to guide you through the creation and maintenance of a classic Neohome; we are currently hard at work on one to cover new Neohomes, but rest assured it is under construction! (Sorry for the weak 'architecture' pun...). Since the new site layout came into effect, all Neohome-related links can be found under the 'Customise' drop down menu at the top. This will take you to the Neohome v.2 hub, but you can still access the Classic Neohome menu by clicking the button in the bottom right corner. Alternatively, you can just click here. First, you will have to reserve a plot of land to build your Neohome on. There are many locations to choose from! After you have chosen your desired location, click on 'Apply for Land.' You must then wait for your application to be accepted. This could take up to 7 hours or so. After your application has been processed, you will be given a Neohome address and you will be able to start building! If you decide to sell your Classic Neohome back to the Neopian Bank, move to a different location, or upgrade to a new Neohome, you will receive some Neopoints back for rooms, extensions, and your property. 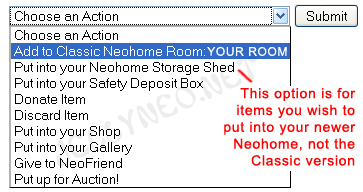 You also don't need to demolish your rooms before the process, and any items currently in your Classic Neohome will be moved to your safe deposit box after the process is complete. After land reservations have been made, you can begin construction of your first room. Click on 'Manage Rooms and Gardens', then click on an empty area where you want your room to go. You must build rooms on the ground floor before you can do so on the first and second floors. NB. make sure you have Pop-Up Blockers turned off, or else the window may not pop up. Finally, click 'Build It!' to build your room. Building a room usually takes around 3 to 9 hours; you can check the Building Status page to see how construction is going. After your room has been built, you can go back to 'Manage Rooms and Gardens' and click on the room to name it. To build a garden, you need to click on 'Manage Rooms and Gardens' and choose a location to build it by clicking on a piece of land on the ground floor of your home. Then click the 'Build a Garden' button at the bottom to build it. Building a garden costs 100NP and takes between 5 to 9 hours to complete. Demolishing a room or garden takes about an hour or less and is completely free. However, you will not receive a refund on what you spent on the room or garden. To start, go to 'Manage Rooms and Gardens' and click on the room or garden you want demolished, and then hit the 'Demolish Room' or 'Demolish Garden' button. Make sure you remove all furniture or gardening items before demolishing, or else they will be discarded! Extension Options are things such as Insurance, Carpeting, Lighting, Heating, Security System, and Wallpaper. You need to have a certain number of rooms before you can purchase each extension option and each extension option comes in different levels, with each level having a different cost depending on the amount of rooms there are already in your Neohome. When building new rooms, you will also have to pay for the extension options you've already bought. Extension options do not change the look of your room or your home in general; currently there are no advantages to purchasing these options. You can choose to remove them for free though, which is handy if your costs get out of hand. Now that you have a Neohome, you need to buy some items to furnish your rooms and plant in your gardens! Furniture and plants can be bought at different shops throughout Neopia. Here is a list of all the shops you can buy furniture and plants for your garden at. In addition to these official shops, furniture can also be bought from the Shop Wizard, Auctions, and the Trading Post. Furniture items in your Neohome are seen from an aerial or bird's eye view. To see what items would look like in your home before you buy them, you can check out Jellyneo's Item Database. To remove furniture or garden items, go to your Neohome and click on 'Arrange Furniture', then click on the room or garden that you want to remove items from. Underneath your room or garden it should say 'Go To Remove Items From Room', click it to enter the next stage. Simply select the items you wish to remove and click the 'Remove' button. To begin decorating, click on 'Arrange Furniture' and select a room. Choose a furniture item and drag your mouse to move it. You can also increase or decrease the depth of the item in order to layer it on top of or beneath another piece of furniture. There are also buttons to rotate your item. You can press Shift + [ or Shift + ] to rotate items at a smaller angle. Locking items means you will not be able to move it unless you unlock it again. This is a useful option if you have spent a long time positioning something fiddly and don't want to move it by accident whilst shuffling other items around. If you have a lamp, speaker, robot or animated toy, you will be able to show or hide the animation by clicking on the 'Action' button. As before, click on 'Arrange Furniture' and select a garden. Items you have added to the garden will appear on the left side. Simply hover over an item until you see a set of four arrows and then drag the item to move it. To flip items horizontally, hover over the bottom of an item until you see a circular shaped arrow and then click on it. If you hover over the white triangle on the bottom left corner of the screen you will be able to change the color of the grass as well as save your garden.